Today’s Archtober tour took in the SeaGlass Carousel and its surroundings at the Battery. Layng Pew, AIA, Managing Principal of WXY architecture + urban design, and Hope Cohen, Chief Operating Officer of The Battery Conservancy, placed this newest addition to the Battery in the context of the Battery’s history. The Battery got its name from the “battery” of cannons placed there in the 17th Century to protect the fledgling port city of New Amsterdam. In the mid-18th Century, the Battery was the site of the country’s first immigrant processing center, which later moved to Ellis Island. It then became an open-air concert venue, and then the New York Aquarium, which was partially destroyed in 1941 by Robert Moses to make way for his proposed Brooklyn-Battery Bridge. Although Fort Clinton, part of the Battery, was landmarked in 1946, the rest of the site was allowed to deteriorate; by the 1980s, this prime waterfront real estate housed a parking lot for municipal agency vehicles. The rest of the Battery was more or less abandoned. By this time, however, Battery Park City had been built next to the Battery. In the mid-1980s, concerned by the decay of their neighbor and namesake, Battery Park City’s management commissioned a masterplan for the area. 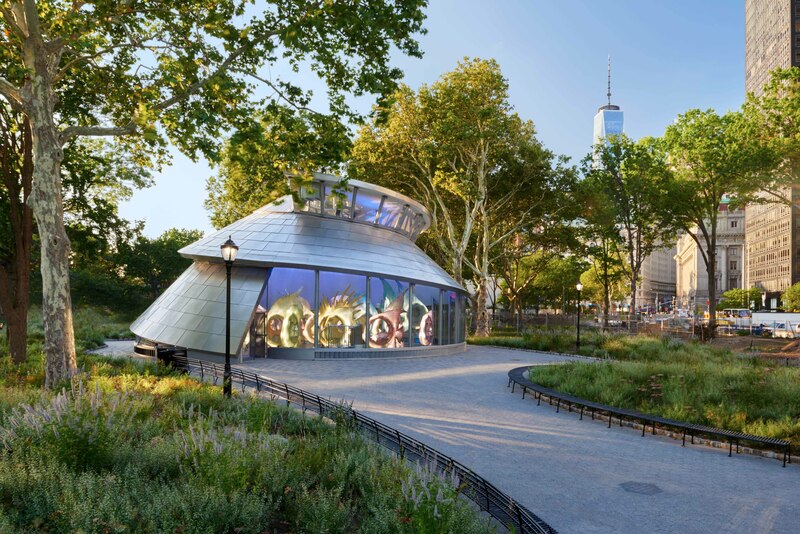 It was this masterplan that sowed the seeds for what the Battery, including the SeaGlass Carousel, is today, and that led to the founding of the Battery Conservancy, which partners with the NYC Department of Parks & Recreation to administer the area. The next phase of development came in the early 2000s, when the Battery Conservancy commissioned a horticultural master plan to supplement the general master plan. The team included WXY architecture + urban design, Starr Whitehouse Landscape Architects and Planners, and Dutch designer Piet Oudolf. During that process, as Pew described it, the designers realized that the eastern edge of the park was dark at night and lacked a focal point. The Carousel was proposed to provide a light-filled center. The idea of having fish rather than horses as the animals came out of a desire to honor the Battery’s maritime location and importance. Despite the building’s small size, its design and construction were far from straightforward. Clients and architects were determined that the building should be a part of the carousel experience rather than simply a roof covering the main attraction. The structure repeats the nautilus shell motif that runs through the Battery, including in the fountain to the west. The design of the ride itself is a collaboration between WXY and artist George Tsypin, whose other credits include the Broadway set of The Little Mermaid and artistic direction of the 2014 Sochi Olympic Games opening ceremony. Rather than have all the fish move in a regular circle, as in a traditional carousel, Tsypin wanted to approximate as closely as possible the experience of a shoal of fish. To that end, Tsypin and WXY placed three small rotating platforms on top of the main rotating platform. Most of the fish are on these small platforms, and thus move in small circles while circumnavigating the room on the large platform. The fish are also on retractable poles that allow them to move up and down. These poles contain electric and electronic wiring that controls each fish’s motion down to a fraction of an inch. (For those, like this author, who are skeptical of moving in many directions at once, there are also fixed fish that only move in the traditional large circle.) To prevent collisions, WXY made an animation of the ride and then analyzed stop-motion frames. The entire design and construction process of the Carousel took nearly a decade. Layng described how, at every step of the way, the Battery Conservancy pushed the designers to maintain the ride’s intricacy and elegance while making it safe and functional. Hurricane Sandy flooded almost all of the Battery, but the Carousel is on a slight elevation, and water stopped about 20 feet short of its foundation. At that time, no wall or roof had been constructed, and any flooding to the Carousel would probably have destroyed the exposed mechanism. Sandy, along with a bankrupt subcontractor, nevertheless added about a year to the construction process – the last details of lighting and sound were completed a day before the Carousel’s opening in 2015. But now that the fish swim merrily in their elegant tank, the SeaGlass Carousel fulfills both of its goals: providing joy to carousel riders and lighting up a previously dark corner of one of New York’s oldest public spaces. Join Archtober tomorrow at the Modulightor Building!